They say the best transition is a cut, but what do you do when a cut just doesn’t cut it? What if you need something to clean up your footage, maybe make talent look a little better? Have you seen what’s new in Continuum 2019? If not, BAVUG’s March meeting is where you want to be. If you have already seen all that’s to be offered in Continuum 2019, then maybe BAVUG can entice you with free pizza, networking opportunities and the chance to win a year’s subscription to many Boris FX products? 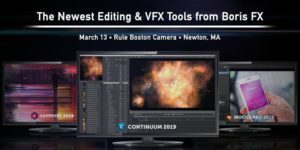 Join the Boris FX team for a look at what Avid editors will be turning to most in the 2019 versions of Sapphire, Continuum, and Mocha Pro. Learn how Continuum’s new Particle Illusion changes how you create high-end motion graphics; track lens flares, spotlights, and rays using the new point-parameter driven Mocha tracking; and add glows, blurs, and more directly onto your titles inside Title Studio. Create flares with ease using Sapphire’s totally revamped and enhanced LensFlare and Flare Designer (a Hollywood favorite); meet your favorite new transition, WhipLash, a warp-speed swish pan; and add digital glitch art looks to your next project with PixelSort. Discover how Mocha’s new Essential Interface (found in Sapphire, Continuum, Mocha AE, and Mocha Pro) makes it easier to not only master tracking due to the streamlined workspace, but to also quickly create masks using 4 new spline tools including a magnetic spline with edge snapping, a freehand tool, and new geometric shape tools. Please read all of the BAVUG info below before registering. Registration for this event is available until 12pm the day of the event (or until capacity is reached). All payments and registrations must occur online prior to 12pm the day of the event. No financial transactions will take place at the check-in. Doors open for admission at 6pm. Please allow us time to finish getting setup before arriving. Meeting/Presentations will begin around 7pm.